The Cat® 745 articulated truck features a world-class cab design, completely re- engineered from the inside-out using global operator feedback to advance comfort and ease of operation. Compared to its previous model, this model incorporates a park brake feature and introduces an assisted hoist control with both auto and manual modes. As a result, up to 50 per cent less operator actions are required. The terrain based throttle control helps to smoothen throttle input over rough terrain to improve ride quality and the advanced automatic traction control proactively applies differential lock to prevent wheel spin. In addition, the directional shift protection protects the powertrain when quickly moving from Reverse to Forward or Forward to Reverse. When the assisted hoisting system is activated with a flick of a switch, brakes are automatically applied and transmission is set to ‘N’. Made with the operator comfort in mind, the Cat 745 has a redesigned cab structure with overall increased glass surface area, improving rear quarter visibility when reversing. The in-cab noise is also reduced to 72dB. The improved door is also 36 per cent lighter to aid in ease of opening and closing. The new automatic climate control system improves heating and cooling with additional vents behind and above the operator. The new touchscreen display has revised menus and intuitive input control that helps to monitor and configure machine options. The Cat Production Measurement (CPM) calculates payload using sensors on the walking beams, displaying to both the machine and loading tool operator when rated payload is achieved. The system helps to maximse every payload and therefore productivity, while minimising overloading and causing premature wear. When CPM is fitted, the wide angle beam lights on all cab roof corners provide clear visibility to loading tool operator and site controllers. In terms of safety the emergency stop brake switch brings the machine to a safe stop in the unlikely event of both main and secondary brake circuits failing. 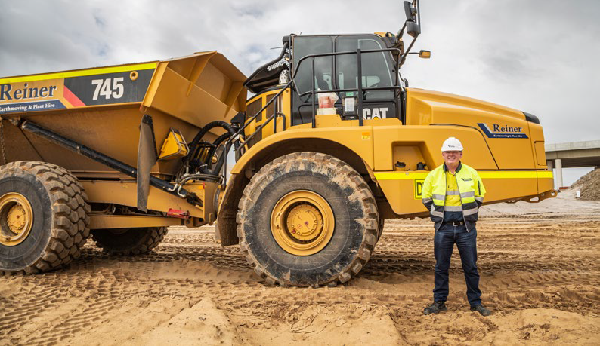 The Cat Detect with Stability Assist also has audible and visual alert to the operator if the tractor and or trailer unit is approaching an unsafe angle during operation; both when driving and when tipping. It will also stop hoisting the body if tipping. Rob Reiner from Reiner Earthmoving based in Perth is one satisfied 745 customer. Reiner Earthmoving started off 15 years ago with a D6. Today, they own a fleet of 27 machines and growing. After consultation with their dealer WesTrac WA, they decided to purchase the 745 articulated truck. 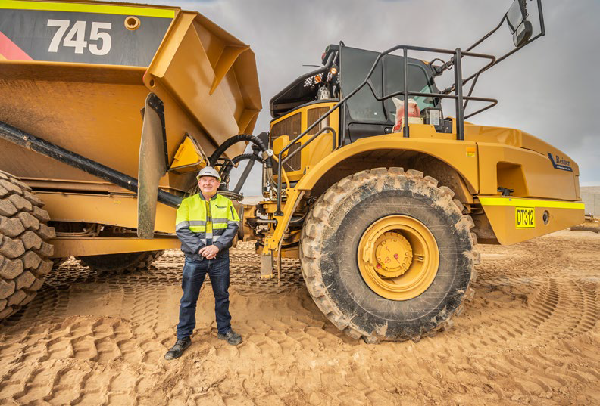 “We were impressed with Caterpillar’s decision to change from a C15 to C18 engine. We noticed huge differences in power. The truck doesn’t wind up in soft sand and power is instant. With the extra power, we also noticed 10 to 12 per cent in fuel savings. This makes a big difference,” Mr Reiner said.